Within our Swag & Jabot category there are different styles to accommodate differing tastes. We also offer our swags in a bias and standard cut. Bias cut means that the fabric is cut on the diagonal, across the grain of the fabric. This technique takes advantage of the greater stretch in the bias, which in turn, accentuates body lines and curves, and allows for the fabric to drape softly. Standard cut swags are cut on the straight, using slightly less fabric, which makes it a more value oriented option. Another differentiation within our Swag & Jabot category is the mounting or hanging options. For a more casual and relaxed look our Pole Swags and Jabots are the way to go. This style also lends itself to contemporary décor. Pole swags and jabots have the soft Velcro heat sealed on the products and the self-adhesive Velcro is included with your order for easy installation. Pole swags & jabots can be installed on 1 3/8″ or larger decorative poles. For a truly custom window treatment, Board Mounted Swags & Jabots are a perfect choice. The timeless beauty of this classic style will make your house the talk of the neighborhood. We handcraft this style and mount it on a covered board for an exact fit. Widths up to 144” are available, with the width of the board determining the number of swags, ranging from one to five. The third category of Swags & Jabots is our rod mounted style. This style gives you a custom look at a value price. 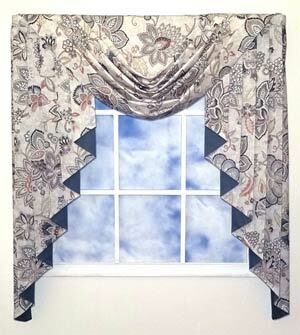 These swags come in three widths and can be arranged to accommodate most sized windows. Here the swags and jabots are sold in separate pieces and are hung on a one inch double or triple curtain rod. There is a “how to” video on our site demonstrating how to hang these. All jabot styles can be made in any length ranging from 27” to 84”. The length chosen is purely a matter of personal preference. Some choose to take the jabots to their window sill, some like to have shorter jabots to just accentuate and give the window some color, while others prefer lengths of approximately two thirds the length of the window. You are the designer, so you can do whatever you envision!